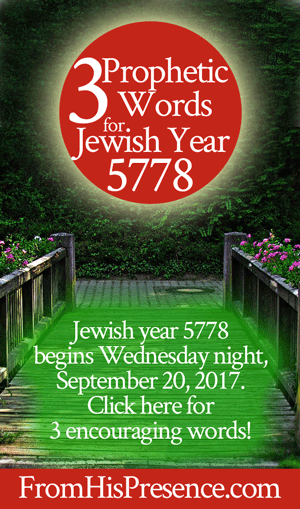 Jewish year 5778 begins at sundown on Wednesday, September 20. The Lord gave me 3 prophetic words for 5778, and I believe they will encourage you! 1. Just in time, Holy Spirit is sending you a double portion anointing. Many of you–especially if you are a prophetic person–have felt like your anointing was gone. You have been through hell and back, and you’re through it now; but your experience has left you feeling dry and uninspired. After praying about this today, I looked out onto my back porch. I often see doves there, but usually only one dove–or, at most, two–at a time. However, this morning, I saw not one or two, but FOUR doves on my porch. Immediately, the Lord spoke to me and told me that He is sending a double restoration of the anointing to His people. Furthermore, this double portion anointing is coming to you NOW. This is not one of those prophecies that you have to wait three years to see fulfilled. God has already begun pouring out the first drops of His refreshing, and you will quickly find yourself under a deluge of healing rain if you will believe Him for it. All the anointing and inspiration that has been stolen from you is NOW going to be restored to you double. You will have twice as many inspired ideas as before. You will hear God twice as well. You will be anointed to prophesy twice as much as you were before. You will have twice as many supernatural encounters as you EVER had before. Beloved, you are not dead. You are not even sleeping. You have been in a time of resting and healing, and now your spirit is going to roar back to life in ways you have never seen before. Hallelujah! If you need this double portion anointing, put a demand on God to flow through you. In situations like this, the anointing works like a pump. You have to prime a pump in order for it to produce flow. If you have lost your flow, go ahead and prime your pump. Specifically put a demand on Holy Spirit to fill you with His flow and anointing. Praying in the Spirit over your day, then immediately carrying out what the Lord gives you unction to do as you prayed in the Spirit. As you exercise your faith to put a demand on God, you will find Him ready, willing, and eager to answer you with that double portion anointing He has promised. 2. In 5778, exercise your governmental authority more than you ever have before. Execute upon all nations and peoples the written will of God. In 5778, it will become increasingly important for you to use this authority to see God’s will carried out in your sphere and around the world. By wielding the two-edged sword, which is God’s Word. For decades, God has been renewing His people’s understanding of how important it is to confess His Word out loud. By this point, mature believers should be well-versed in the power of speaking God’s Word. In 5778, it is time to move from simple understanding to very purposeful action in this area. All around the globe right now, there are situations which need the governmental interference of God. The situation in North Korea stands out to me as one of the most important challenges that God’s people need to address. However, many other situations both in your house and around the world will benefit from God’s intervention as well. The unreached people groups who still need to hear the Gospel; and more. If you would like to receive all that God has for you, I strongly encourage you to set aside 10-15 minutes daily to praise God and confess His Word out loud. Confess His Word over yourself and over world situations that concern you. 3. Expect your intimacy with God to produce visible results this year. Many of you have been sowing and sowing into the secret place of intimacy with God. You have been doing this not to get any material thing, but out of a true love for God. Your heart has been pure, and your hands have been clean. Despite this, you have not seen the results manifested in your life that you have been hoping to see. God’s Word provides many great and excellent promises about how God will bless you if you diligently seek Him … but you have not yet seen those results. Although your faith in God has not wavered, you have wondered these same things. But the Lord told me: 5778 is the year of the Joshuas. Like Joshua, you have lingered long inside the tent of God’s presence. You have not departed from His ways, nor from seeking His face. His presence is your greatest love, and serving Him is your supreme pleasure. And you are about to be elevated. You are about to see the manifestation of many promises that God has spoken to you. The things He has been whispering in your ear will soon become visible for all to see. Father God will put the fear of the Lord upon all those around you, and they will tremble at your approach. This is the year of Joshua. Expect God to work miracles on your behalf this year. Expect His anointing to rest upon you. Expect the Commander of the army of the Lord to appear to you in person. Expect a supernatural paving of the way in every situation you encounter. 5778 is the culmination of many long-awaited promises. It is a year that opens a new season of healing, wholeness, and freedom; a new era of taking territory for the King; and a new age of government for all of God’s people who will. Will you exercise your faith to receive, and to move forward with God? If so, leave a comment below! Thank you Jamie for this word it has really blessed me. Jamie, Thank you for allowing the Holy Spirit to use you to give these powerful words. I have felt like I was on a desert until today. Today, I praise the Lord for the desert. Thank you for helping me to see my future through God’s eyes. I am in such humble gratitude for reading this article. Thank you so much for spreading God’s word and holy grace. I look forward to rising and assisting in the ascension of humanity through global service of his word. I send much love and blessings to you all! God Bless you!! I just found your blog a few days ago and I must say you have truly blessed me. I would love to help and sow a seed on your missionary work. Hi Lakisha! Thank you and we are glad you’re blessed! We’d love to have your help anytime. You can donate to the ministry via Gumroad or via PayPal. Thank you! Praise God for this exhortation! He is speaking directly to my situation through you. I have been faithful but discouraged about so many things–feeling forgotten and put on hold. A season of dryness indeed. I will carry through with these prophecies and align myself with what needs to be done through the power of the Holy Spirit. Amen. Jamie, I thank you for this word for me today. This is what I needed to hear. I have been praying and believing for a big breakthrough for my life now. I know this was from God for me right now. May he continually bless you and your family. Yes, yes, yes! Glory be to our Lord and King! Jamie thank you for being a faithful servant of God. I receive all the blessings you talked about, I have been praying for awhile for more of God’s anointing in my life and boldness to carry out His will. May the Lord bless you ❤️. Praise be to God, he is so good to me, and I appreciate your ministry Jamie. Thank you for this word from God! It spoke directly to my spirit. I believe it and receive it in Jesus name. this is so much for me and the entire body!!!!!!! i smiled from ear to ear. God bless you,Jamie and your family and ministry!!! AMEN!!!! Anointed word for sure Jamie! I praise God for his goodness and your obedience. I am so excited to see what is about to happen. This last weekend the Lord spoke into me exactly what you said in this blog and you just confirmed it! The Lord laid me out and changed my DNA!!! I am tear-filled and trembling with excitement! You just clarified what the Lord taught me and a few things that I knew but didn’t understand the why of it! I know my patent is coming and more! I am praying for you and your little family, such an exciting time! I am looking forward to the honor that God is going to give me to support your ministry much more than I do now! This is about to get crazy up in here!! Yeah God!! Couldn’t have said how I am feeling right now any better!Thank you JESUS!! I want to thank the Lord for the prophetic word that went forth!! I am super excited because this is Confirmation!!! Thank you Jesus!!! Thank you Jamie for the prophetic word. Spoke directly to me. Be Blessed with your family, and may your Ministry grow and reach a lot of people more especially those who still do not have a personal relationship with our Lord Jesus!! Thank you for this word I really needed to hear this and I am comforted in my heart by this word. God bless you. Praise God for this Word. Thank you for your obedience. God richly bless you and everything that concerns you. Glory to the most high God! This word was right on time. I am so greatful for this double portion of anointing! He reigns forever!!Hallelujah!! I will bless the Lord at all times His praise shall continuously be in my mouth!! The Lord bless yoy, Jamie. This makes TRIPLE confirmation for me! Abba, let every fiber of my being that You hand-crafted be drenched in the river-making downpour of the fulfilment of this Your Rhema. With a grateful heart full of faith, overflowing with Your new song, even tehillah, I receive it! Tetelestai. I know in my heart this message was for me and I will gladly receive it. Keep me in your prayers, I’m believing God diligently for salvation, for my whole household. Amen! Jamie thanks for sharing this powerful word today!!! Thanks for this confirmation! My Pastor spoke this word concerning the year 5778! Truly the Lord has spoken! This prophetic word is empowered by the Bread of Life and the Living Water. It is inspired by the life and power of the Holy Spirit! The God of our salvation has sent a word of healing, hope, renewal, and refreshing that comes from the presence of the Lord. During this time of illness I praise Jesus! Your words encouraged me today. I’ve been really low and needing reminders that God’s timing is perfect. I stand on His Word and promises of healing. I will be healed, in Jesus’ name Amen! I WILL exercise your faith to receive, and to move forward with God. I love reading these inspirations. They are always on-time in what I am going thru. Yes I was truly blessed and refreshed by this word God gave you to share. I decree and declare and I believe and I receive it. I know God is and going to move mightily in my life and am Ready Lord ready ready ready. Thank you Lord and thank you Jamie for sharing. God bless. Yes! Yes! Hallelujah! I believe this Word is for me and I receive it in Jesus’ Name. I have been in a desert place for a while and have been praying for a fresh anointing. HALLELUJAH! I’m open empty and ready to receive. God bless you Woman of God for your obedient service for His Kingdom. Thank you so much Jamie for allow God to use you and sharing this prophetic, I believe and receive and God is begin what you have spoken in my life already. I will keep you update with my progress and what God is doing and soon be bless to your ministries. Thank God. Thank you Jamie for allowing God or Heavenly Father to speak directly into the situation I am in right now. A dry place filed with spiritual warfare as I have never seen in my lifetime. I call out for and receive this beautiful double portion anointing. For though my knees were buckling, I stood in faith. Though I was pressed down I stood in faith. Though the enemy surrounded me I held strong in faith and prayer in the full armor of God surrounded by chariots containing angel’s who stood at the ready keeping me safe in all my ways. May you be blessed abundantly as your are a blessing to me. I live apx 4 hours from where you are and with some of my sisters in Christ are praying that we may in His due time meet with you face to face. Thank you Jamie for your obedience in releasing this WORD. It is very powerful and speaks deeply to my heart. I look forward with excitement to see this WORD manifested for the Glory of God in Jesus Name by His Spirit. I receive It in Jesus Name. May the Lord continue to bless you and keep you in Jesus Name!Happy new year 5778! Been hearing 5778 a few days now and was wondering how to effectively release “sharp” and bold words. Thank you Jamie for your diligence and the love of YESHUA. HIS presence is what I crave for and to share HIM to others. Jamie bless you. Been hearing 5778 and now you targeted bold and sharp points to pray. Claiming for my son who has wandered along the “dusty” road because of losing his dad when he was 9 years thereafter both grandfather’s and eventually a believer brother who helped me and also died shortly after that. Though he is 27 and his unbeliever friends keep him occupied, I cling onto the promise in Jeremiah 31:16-17 which will come to pass in my life time. GOD bless you as you obediently and diligently share with many. Thank you for the encouraging words. We’re standing in faith and declaring God’s word for revival in the church and multitudes to come to Christ in the UK. On earth as it is in heaven! God bless you Jamie I am speechless .God continue to raise you from strength to strength.? Praise God! Thank you for this word! I am ready to go out! Thank you :ord for expanding my faith and trust! Praise God! I donn’t know how it will look when it comes, but you know, and that is best! Thank you I pray Lord restores me I desperately need it, I believe The Word by Faith and hope Lord encourages me through the process. I’m so thankful I stumbled across this blog. Thank You God for Your Blessings and Good Fortune that are already coming to me now and in increasing quantities daily. May this New year bring in bountiful Blessings for all who really need it and can use it well. This really encouraged me! I was searching for info on year 5778 & found this page. Going to be Priming the Pump! The LORD’s been speaking ever so softly and lovingly about what is to come! this new dimension – like a caterpillar in the cocoon being formed by the spirit of God – coming through to break out and fly into this new AMAZING dimension where it is manifestation time. A place of Never Experienced Wonders!! 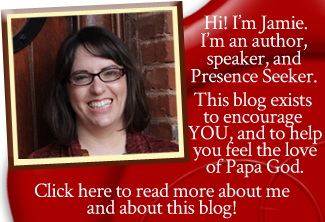 Divine Order brought me to your blog and I thank you for your heart to His heart and sharing with the world! Now is the time for the saints of the Most High to rise up! Yes Jamie! I receive double. Thank you for your prayers and obedience to God. My God!! What a powerful revelation of 5778! This word was very accurate and timely. My heart is so full right now with what Abba shared with you. Thank you for your obedience and may the Lord continue to bless your ministry. Thanks a lot Mr Jamie for the truthful and inspirational message from God, you have really blessed my life and may God bless your life and everyone’s life in this world. Thank you beloved of the Lord. Every word you shared was arrow sharp and piercing, in the most wonderful way. I am in awe of our Father GOD and the HOLY SPIRIT. I humbly receive the anointing you speak – Isaiah 61:7, is also a promise of the double portion that Abba has given to my heart for my family. Also, Zech. 9:12. GLORY to His holy name. Our Father is FAITHFUL. Much agape love and blessings to you, sister of my Father’s heart. Thank you for this. It added to my very newly found belief in this year of 5778. I was just turned onto Chuck Pierce who is on to this by the Lord’s leading. I watched his YouTube videos. I have had SO MUCH stolen from me for many, many years….financially, relationally, spiritually, emotionally. These past two+ years have been the absolute worst in my life for faith, pray and financial income as well as faith for His provision for it. I’ve been literally dead inside my whole being. I need prayer. I’d gone into drinking, even heavily all by myself. I live alone and am extremely lonely and feel I am without God in my life. I’ve been a believer since age 16 and I;m 52 now with nothing but a huge tax debt. Since you are a believer since age 16 and are still a believer, God will never forsake you. Even though things have been stolen from you, as you continue to abide in Jesus Christ, He will sustain you as He has promised. He is pleased when we trust in Him, and we are not to worry, as Jesus told us in the Sermon on the Mount. The kingdom of God does not consist in material possessions. Please do not give up your hope in Him as your Deliverer who will help you in EVERY situation. Wow, what a blessing to hear God speaking through you to me. I have been in those dry places, but felt the wind beneath me taking me to those green pastures and releasing the doybke portion of the Prophetic anointing that was stifled. Thank God that He has all wisdom, and power in His hand and that He was and is able to keep me and my family. Many blessings to you for your obedience. This is more of eye opening with fresh insight and stirring up from within. Just got to know about the 5778 Jewish year two days ago. I have been dead like dead spiritually with all the zeal and covenant I made with God completely blacked out. I thank God for the event of two days ago that opened my eyes to reality! I came into your blog with a level of curiosity to learn and understand more about the 5778 agenda only to realize that the vision and prophecies of the 5778 is the same! I am glad in my spirit for the privilege of keying into this mystery! I shall be a partaker of each of the prophecies, my season of revival and restorations of all I have lost has come. I am really trusting God for a consistent abiding to the graces and mercies that go with the season, kindly pray for me in this line. Thanks so much Jammie and God bless you. Thank you for writing this blog today this answered many of my prayers and questions as I have been going through a tough time looking for Gods answers and feeling as you said “dried up ” and or not hearing God.. and I feel he answered my prayers here that my trial and tribulation I have been suffering through ,, he will end by his divine intervention and raise me up and out of this by his right hand and intervention.. I saw it a few months ago plain as day .. when he intervened and delivered me from Prison for false charges brought against me.. I know the Lord will raise me up from this case and deliver me as he knows my innocence and heart and I know that the lord has much for me to do.. He saved my life so many times this year.. and To GOD be the glory that I am alive !! In Jesus name! This prophetic and prolific Word of God is spot on for me and my new season. Yesterday, December 17 I preached about “Preparation before Elevation”. I referenced 1 Chronicles 22:2-5,19 and I encouraged the people of God that greater is coming as we rebuild the house of God. The school “house” will become a “house” of wisdom; the jail “house” will become a “house” of deliverance; the court “house” will become a “house” of righteousness; the sick “house” will become a “house” of healing; the brick “house” (people) will become a “house” of faith; and the church “house” (body of Christ) will become a “house” of prayer! Glory to God for the confirmation and affirmation that His Kingdom is coming down from heaven to earth. More importantly, Jamie, we are leaving the wilderness and executing God’s plans in the Promised Land. May He continue to bless you exceedingly, abundantly, above all that we could ask or think of! So excited for this new season we are about to walk into! WHAT a word from the Lord. To God be the Glory for all the things he has already done. Its a exciting time for God people. Im so ready to walk in the double anointing. Nothing. Matters now. But to see and feel his Glory. Thankyou for that AWESOME WORD. I’m abundantly grateful that God has led me to your ministry at this time. It is exactly what I need to walkthrough this season of my life and I couldn’t be more grateful. Thank you for your obedience and transparency! You are changing lives!! So glad Papa blessed you, Tyisha! Welcome to our community! Poweful word, thank you. But just a heads-up. Your adword links sre detracting from your ministry. I recommend you go go to the settings and specify which kind of ads not to show or find another way to monetize your site. Blessings in Jesus’ Name. Hi there. All ad settings are already set to block anything offensive or un-family-friendly. Occasionally, an ad gets through the blockers. If that happens, you can help by clicking “report ad” next to the ad and reporting the ad as offensive. I do not see the same ads a reader sees, so I try to keep watch on this but am not always able to see each one to report them. Thanks! Jaime for this prophetic word. I thank GOD for his unction on your life and making you a vessel to minister to his people. I came across this while searching for something else but The Holy Spirit never makes Mistakes, what you wrote is a confirmation from GOD , the truth is not too long I asked GOD how long? and he answered me, I didn’t ask because I can’t take it anymore ; Am not serving GOD or loving him for things and even if what am waiting for don’t come, it won’t affect my relationship with him, I want to know him more but as I write this, The Holy Spirit is saying I have not called the sons of Jacob to seek me in vain, even if you don’t want it, I have said and I would do it. I also received direction in regards to what you said,10-15 minutes word speaking. I actually received revelation on how much of the word I speak influences my life positively but I had a challenge ( It was do I speak the word only when something negative comes up and it has not come much so I don’t speak the word much) but I know I will do that and also carve out time to say what the word says. Thank you so much for yielding yourself to GOD’s work. More grace and continue to soar higher in the strength of the Lord. I have been blessed and motivated by this so much and can’t say just how much. Thank you Jaime. Blessings upon you and may God’s wondrous presence be multiplied in your life an in all you do in Jesus Name. Amen. Amen. Amen. Praise God for this powerful blessing!!! I have struggled over the years because I thought God had spoke several truths over my life, but I too felt like “the well went dry.” So many things you spoke of in this blog was direct confirmation from the Lord…even you suggesting to spend 10-15 minutes a day with God (He specifically told me 15 minutes a day). Its only by the power of the Holy Spirit that I found your powerful words, and in the name of Jesus, I receive each one of these three blessings. May God bless you for stepping out in faith and writing to each one of us “who has an ear to listen what the Spirit is saying to the churches.” God bless!!!! Thank you Jamie for your obedience to God in delivering the prophecy He gives you. It is greatly needed! I am immensely encouraged to know there are many others who are seeking relationship and am humbled to tears that there are yet others who dare to share our Great Fathers desire to have real and lasting, true blue, relationship with us just like a Father would and a friend to whom we love so deeply but never as deeply as He, our precious and all together delicious( “taste and see…”) Father. I am a Shepard to those who are hurting in the streets of our L-rd’s lands. Our Father has given me a period of rest and I am eager to see what I get to do next in our Father. My spirit has been weighty and I have wondered if my eyes ,my heart would ever see a people who just long to be “in Him”, to commune with Him. Stop the religious rhetoric and just full on push for “Him Alone” and more and more and more of “Him Alone”! How encouraged I am! How grateful my soul is to Adonai who has given me this glimpse, this taste so that I may begin to see the beginning of my humble and beseeching request that His people desire more of and only Him! Thank you for your obedience,your humility and most of all your desire for more of Him! My heart is encouraged as I await new instructions from my Father, my Friend, my King, My L-rd, my Salvation, my Counsel( in this case He used you), my Hope, my eternal and truest love, my G-d, my Adonai! May the eternal span of His wings cover you as He directs your path. May you move ever forward as He lovingly directs your footsteps. God is not unrighteous to forget your work and labour of love which ye have shown towards his name, in that you have ministered to the saints and do minister. I am so encouraged to tears by this! Yes yes yes Lord!! Blessings and Amen. I stumbled on your site when I googled the number 5778 (loads of people think God’s telling them this is Rapture year). I identify with the bit about resting and healing rather than being dead or asleep. I experienced burnout and virtual breakdown after being made redundant by a Christian company 17 years ago. I moved away from prophecy etc after my church split and my mother’s death but have been reawakened to it all following all the rapture prophecies surrounding Billy Graham’s death. Amen! I receive this Prophetic Word for me and my family for the year 5778 in Jesus’ Name, Amen. Thank you so much, and God bless you and your family. Hi Vickie! Great to hear from you. Welcome to this community! The year 5778 refers to the number of the year on the Hebraic calendar, which is actually God’s calendar. Each New Year begins on Rosh Hashanah, which this year begins September 9. Hope this helps! The Good Lord bless and keep you. Thank you Jesus. Amen!